It was emphasised in Zappos’s CEO letter that the Zappos brand will remain intact and that “Amazon are not looking to have their folks come in and run Zappos unless Zappos ask them to”. 1) Do we believe that this will accelerate the growth of the Zappos brand and help us fulfill our mission of delivering happiness faster? 2) Do we believe that we will continue to be in control of our own destiny so that we can continue to grow our unique culture? After spending a lot of time with Amazon and getting to know them and understanding their intentions better, we reached the conclusion that the answers to these 2 questions are YES and YES. The news was a total surprise as there was nothing heard about the deal before this at all. Shoes were what Zappos were really good in selling although they did branch out to other items in recent years. Did Amazon’s Endless.com (selling shoes only) sort of eat-up a piece of Zappos.com marketshare that triggered this deal to happen sooner than later? 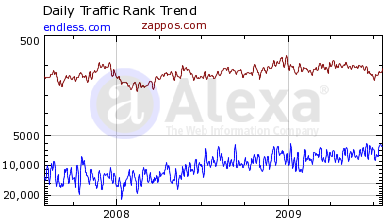 A comparison on web traffic for both Zappos.com and Endless.com using Alexa (an amazon company, again!) shows the following chart. Zappos.com was constantly in the top 1000 most visited site while Endless.com was constantly in the top 5000. This goes to show that although Zappos web traffic growth might not have been as great as Endless’, it is still constantly leading the way. In fact, Zappos surpasses the $1 billion mark of gross merchandise sales in 2008 last year alone. Together, Endless and Zappos will certainly dominate the buying shoes online niche. Amazon has been doing really good in terms of coming up with innovative technology (especially the Amazon Web Services and Kindle) and continue to grow year over year (unlike ebay). Zappos decision to sell itself while it’s still at the top is probably a good move and would be beneficial for both companies.